"So you're walking with your iPhone in one hand, and a Starbucks latte in the other, and granted it is possible to use the iPhone in one hand, it could prove to be "fatal" since one hand tends to offer less support compared to two, and we all know that heart wrenching feeling when your brand new gadget slips out of your hand and onto the hard pavement." 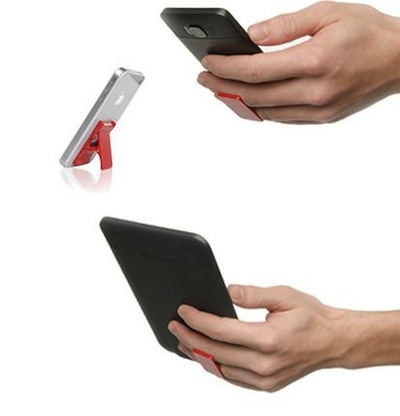 Basically very simple, as all this does is attach to the iPhone case or the iPhone itself and you slide your fingers in and can start using your iPhone one handed without fear of dropping it. I can also be attached to the back of your iPad, or any other tablet for that matter. As you can see from the photos, it doesn't have to be an Apple product to work. Three sizes (small, medium and large) depending on the finger size and you can get them for $29.95 USD each from the Flygrip store located here. That seems a bit spendy to me, and I think I would rather just spend that on a better case. What are your thoughts? Why not take a FREE clip from a clothes hanger and use a sticky fixxer pad to affix it to the back of the phone? I think the concept is nice, but I don't see it as being very practical except for use as a stand (as one picture shows). I just held my iPhone 3G and noticed that my little finger is across the bottom of the phone and my other three fingers are spread pretty evenly across the back. Having a non-slip case on it, it seems quite stable that way. And with my finger(s) not 'clipped' to the phone, I feel I have a little more maneuverability too. I can set it down, put it in my pocket, or hand it to a friend without having to first detach it from my hand. One more thing, it adds more thickness to the iPhone or iPad than a non-slip case would. But the colors are nice!